In 1915 Christian Schad was among the pacifist artists who headed for Zurich seeking refuge from the war. There widespread malaise spawned the founding of the subversive movement which became known as Dada and, following the establishment of the poet Hugo Ball’s Cabaret Voltaire on 5 February 1916, began to spread its irrational provocative spirit through many other European cities. “The new artist protests: he no longer paints, ” wrote the poet Tristan Tzara in its first manifiesto. On arriving in Zurich in the spring of 1915, Schad, until then an Expressionist painter, joined the Dada movement and collaborated with the writer Walter Serner in creating the literary and art review Sirius, which was forced to close down not long afterwards. In 1916 he moved to Geneva, where for a time he produced reliefs using unorthodox Dadaist techniques and created the so-called “schadographs, ” experimental photograms similar to Man Ray’s rayographs, produced by placing certain objects on photographic paper and exposing it to light. The present Composition in N was executed in Geneva in 1919 and shown in the exhibition organised by his friend Walter Serner at the Salon Néri in the city in February 1920. 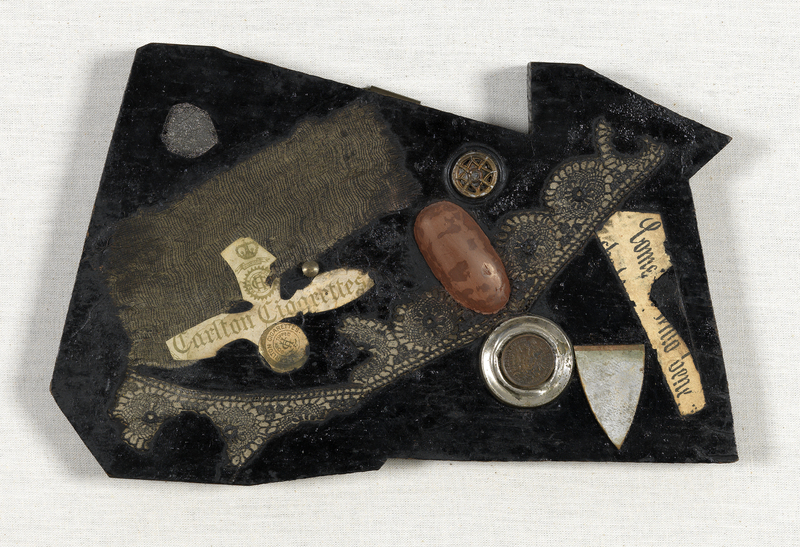 Arranged at random over a small, jagged-edged piece of wood painted in black — the colour to which the letter “N” in the title most likely alludes — are a series of “found objects” such as a coin, an insignia, a strip of lace, a cutting from the wrapping of a pack of Carlton cigarettes and a piece of silver foil. Schad’s relationship with Dadaism was very short lived. In 1920 he moved to Rome, where he embarked on a new artistic period based on the teachings of the Great Masters of painting.